An 84 year old woman presents to the emergency department with a week of nausea, anorexia and general malaise, without abdominal pain. She has a past history insulin dependent diabetes, GORD and osteoarthritis. It was noted on examination that she was moderately jaundiced, with a non tender abdomen. A point of care ultrasound was undertaken during her clinical examination to determine the cause of her jaundice and nausea. 1) Severely distended common bile duct (2.4cm) which could be followed down to an obstruction at the level of the head of the pancreas. The CBD should be less than 6mm in patients under 50, and less than 8mm if over 50. A CBD of up to 1cm can be normal for patients who have had a cholecystectomy. 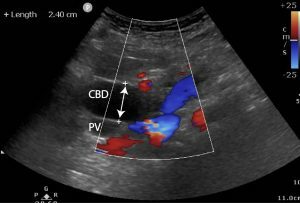 A visual assessment can be done by comparing the CBD with the portal vein (PV). As a rule of thumb the CBD should not be equal in size or greater than the portal vein (PV ) (10 – 13 mm) unless the patient has had a cholecystectomy where 10 mm for the CBD is acceptable. 2) GB dilatation to 13cm longitudinal (normal GB length 7 to 10 cm) with associated cystic duct dilatation. 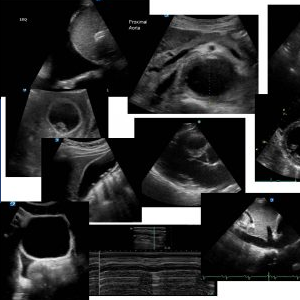 Absent sonographic signs of cholecystitis. 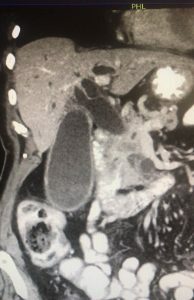 This has been described as Courvoisier’s gallbladder which is an enlarged , often palpable gallbladder due to carcinoma of the head of the pancreas. It is associated with jaundice due to obstruction of the common bile duct. 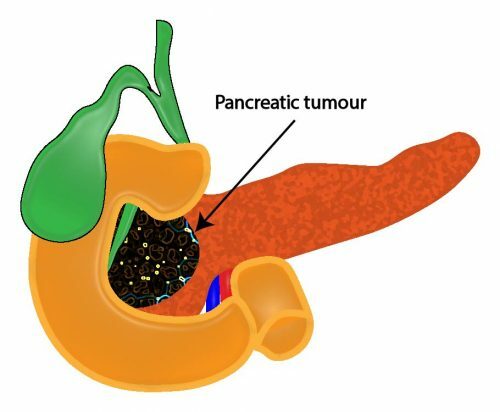 Courvoisier’s law refers to painless enlargement of the gallbladder with jaundice likely to result from carcinoma of the head of the pancreas and not from a stone in the common duct, because in the latter the gallbladder is usually scarred from infection and does not distend. 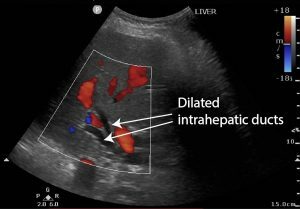 3) Liver: Intrahepatic duct dilatation. Intrahepatic ducts should not be visible unless they are dilated. 4) Poorly defined, hypoechoic 3cm pancreatic head mass obstructing bilious outflow. The patient underwent a CT Abdomen / pelvis which confirmed a 38x28mm mass in the head of the pancreas, with complete pancreatic and common bile duct obstruction, highly suspicious for pancreatic adenocarcinoma. She proceeded to an ERCP which was complicated by a small duct injury but ultimately successful. Her bilirubin and LFTs returned to normal within days and her histopathology has shown pancreatic adenocarcinoma. 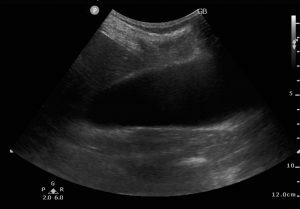 Ultrasound examinations are not first line investigations for painless jaundice, as they are frequently disturbed by excessive GI gas, associated with accompanying ileus. CT is superior to ultrasound in demonstrating pancreatic lesions, as well as contour irregularities or focal changes in the pancreas. 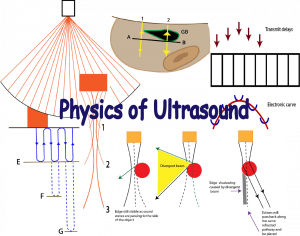 However, it has been shown that trans-abdominal ultrasound has high sensitivity for detecting biliary tract dilation and establishing the level of obstruction. While the reported sensitivity for US in diagnosing pancreatic cancer is 95 percent for tumours >3 cm, it is much less for smaller tumours. 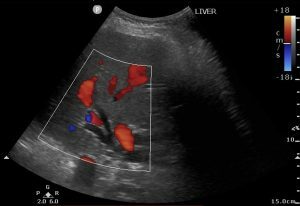 Sensitivity is also dependent upon the expertise of the sonographer and the presence or absence of bile duct obstruction. 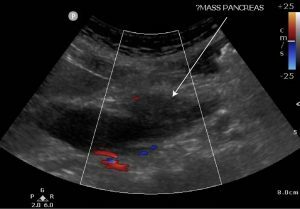 On ultrasound, a pancreatic carcinoma typically appears as a focal hypo-echoic hypovascular solid mass with irregular margins. Dilated bile ducts may also suggest the presence of a pancreatic tumour. fr Health Sci. 2016 Dec; 16(4): 1163–1168. 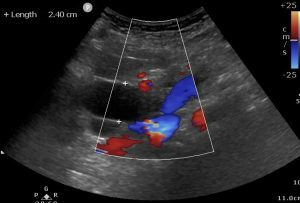 Sonographic assessment of the portal vein diameter in apparently healthy adults in a Northern Nigerian population. AJR 139:497 -499, september 1982 0361 – 803X/82/1393 -0497 Island Jewish-Hillside Medical Center, New HydePark, NY 1 1 042. This entry was posted in Cases, Dilated CBD. Bookmark the permalink.